– a family own business since 1962, premier florist in Newport Beach area providing flower arrangement services, local online flower delivery services and more. The flower shop is located in the heart of Newport, CA. 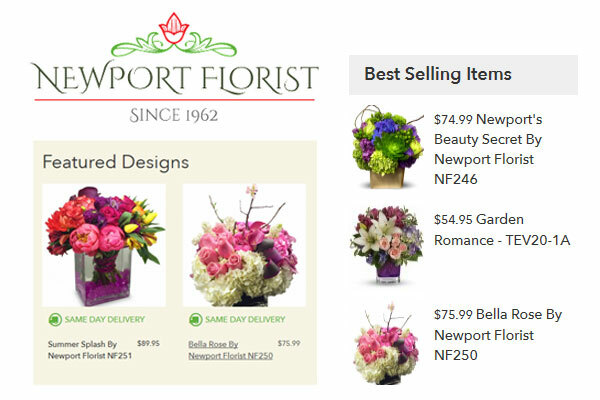 Newport Florist offers a wide range of selection of plants and gift baskets for all occasions. Send flowers in Newport and surrounding areas. Wedding – Centerpiece, Hand Tie Bouquet, Boutonniere, Corsage. Flowers – Calla Lilies, Cymbidium Orchid, Daisies, Dahlias, Delphinium, Hyacinth, Hydrangeas, Lilac, Lilies, Peonies, Roses, Succulents, Sunflowers, Sweat Pea, Tropical, Tulips, Plants, Phaelonopsis Orchids. Occasions – Valentine’s Day, Love and Romance, Anniversary, Just Because, I’m Sorry, Birthday, Get Well, Thank You, Congrats, New Baby, Sympathy and Funeral. Delivery Areas : Aliso Viejo, Corona Del Mar, Costa Mesa, East Irvine, El Toro, Foothill Ranch, Huntington Beach, Irvine, Ladera Ranch, Laguna Beach, Laguna Hills, Lake Forest, Mission Viejo, Newport Beach, Newport Coast, San Juan Capistrano, Santa Ana, Tustin. Delivery Zip Codes : 92602, 92603, 92604, 92605, 92606, 92609, 92610, 92612, 92614, 92615, 92616, 92617, 92618, 92619, 92620, 92623, 92625, 92626, 92627, 92628, 92630, 92646, 92647, 92648, 92649, 92650, 92651, 92652, 92653, 92656, 92657, 92658, 92659, 92660, 92661, 92662, 92663, 92675, 92690, 92691, 92692, 92694, 92697, 92705, 92709, 92710, 92713, 92714, 92715, 92718, 92720, 92780, 92781, 92782.